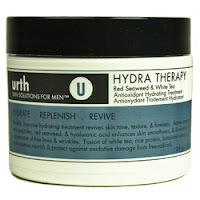 When I first heard of urth Skin Solutions for Men, I was impressed and intrigued by the name and also by the Eastern sounding ingredients like green tea, white tea, red seaweed, lemongrass, rice and ginseng — I HAD to try it. urth did not disappoint. From the sumptuous formulations and minimalist, no-nonsense package design right down to the HOT models on their website, urth products made it to my hot list! I put this product line in the "high performance" category of skincare products. Along with the good results that I've with the urth line, there's something else that I really enjoy and that’s the fragrance. The aromas are very soothing, pleasant and clean without being soapy or too herbal. Nice! Shave formula: very creamy and slick; I got an excellent shave using a DE razor; great scent–I think it’s the ginseng. Hydra Therapy: I use it as a night cream and definitely feel and see the improvement in the morning. I like this one a lot. Forbes, Instinct and urth Face Wash is the winner of Men’s Heath Magazine Grooming Award. 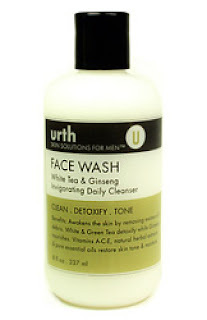 Check out urth owner Bob Mah’s Skincare Training-4-men. I couldn’t have said it better myself. Put urth on your list. Sounds nice, but it's $$$ expensive. It is $$$ and YOU'RE worth it! I love they offer a travel kit on their website. To their competitors, take notes. excellent find. Am loving these products. Getting fantastic results with these products. My skin looks and feels younger.